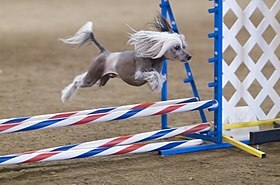 A hairless Chinese Crested taking part in an agility competition. Because each course is different, handlers are allowed a short walk-through before the competition starts. During this time, all handlers competing in a particular class can walk or run around the course without their dogs, determining how they can best position themselves and guide their dogs to get the most accurate and rapid path around the numbered obstacles. The handler tends to run a path much different from the dog's path, so the handler can sometimes spend quite a bit of time planning for what is usually a quick run. The walk-through is critical for success because the course's path takes various turns, even U-turns or 270° turns, can cross back on itself, can use the same obstacle more than once, can have two obstacles so close to each other that the dog and handler must be able to clearly discriminate which to take, and can be arranged so that the handler must work with obstacles between himself and the dog, called layering, or at a great distance from the dog. Printed maps of the agility course, called course maps, are often made available to the handlers before they run, to help the handlers plan their course strategy. The course map contains icons indicating the position and orientation of all the obstacles, and numbers indicating the order in which the obstacles are to be taken. Course maps were originally drawn by hand, but nowadays courses are created using various computer programs. Each dog and handler team gets one opportunity together to attempt to complete the course successfully. The dog begins behind a starting line and, when instructed by his handler, proceeds around the course. The handler typically runs near the dog, directing the dog with spoken commands and with body language (the position of arms, shoulders, and feet). Because speed counts as much as accuracy, especially at higher levels of competition, this all takes place at a full-out run on the dog's part and, in places, on the handler's part as well. Scoring of runs is based on how many faults are incurred. Penalties can include not only course faults, such as knocking down a bar in a jump, but also time faults, which are the number of seconds over the calculated standard course time, which in turn is determined based on the competition level, the complexity of the course, and other factors. Agility field left side: A competition agility field showing (clockwise from lower left) a tunnel, the dogwalk, the judge standing in front of a winged jump, two additional winged jumps, dog executing the teeter-totter with his handler guiding, and the tire jump. Course map showing the layout of the course in the preceding photos. Maps like this are commonly used by officials to communicate the course to handlers. Agility field right side: The right side of the same agility field showing (clockwise from foreground) the weave poles, the pause table, the A-frame, two winged jumps, the collapsed tunnel (or chute), and a wingless jump. Numbered orange plastic cones next to obstacles indicate the order in which the dog must perform them. A Hungarian Vizsla climbing an a-frame. Two broad ramps, usually about 3 feet (0.91 m) wide by 8 to 9 feet (2.7 m) long, hinged together and raised so that the hinged connection is between five and six-and-a-quarter feet above the ground (depending on the organization), roughly forming an A shape. The bottom 36 to 42 inches (0.91 to 1.07 m) of both sides of the A-frame are painted a bright color, usually yellow, forming the contact zone, onto which the dog must place at least one paw while ascending and descending. Many sanctioning organizations prohibit that A-frames have low profile, narrow, horizontal slats all along their length to assist the dog's grip going up and down due to the number of dogs that have broken their toes on the slats; other organizations allow slats; and many organizations now allow or require a rubberized surface so the dog can ascend and descend easier. Some organizations allow the top of the A-frame to be narrower than the bottom. Three 8 to 12 ft (2.4 to 3.7 m) planks, 9 to 12 inches (23 to 30 cm) wide, connected at the ends. The centre plank is raised to about 4 feet (1.2 m) above the ground, so that the two end planks form ramps leading up to and down from the center plank. This obstacle also has contact zones. Many sanctioning organizations require that dog walks have low profile, narrow, horizontal slats all along their length to assist the dog's grip going up and down; other organizations prohibit slats; and many organizations now allow or require a rubberized surface. A 10-to-12-foot (3.0 to 3.7 m) plank pivoting on a fulcrum, much like a child's seesaw. It is constructed slightly off balance so that the same end always returns to the ground. This is done either by placing the support slightly off-center or else weighting one end of the board. This obstacle also has contact zones. However, unlike the other contact obstacles, the teeter-totter does not have slats. Many organizations now allow or require a rubberized surface. The balance point and the weight of the plank must be such that even a tiny dog, such as a Chihuahua, can cause the high end of the teeter-totter to descend to the ground within a reasonable amount of time, specified by the sanctioning organization's rules (usually about two seconds). Smaller dogs get more time to run a course, and this is one reason why it can take them longer than it takes larger dogs. A 4-foot (1.22 m) high, 3-by-3-foot (0.91 by 0.91 m) square platform, with ramps similar to those found on a dogwalk descending from the center of three or four of its sides. The dog must ascend the correct ramp and then descend the ramp indicated by the handler, possibly changing direction to do so. This obstacle has largely been discontinued due to its cumbersome size and danger of dogs falling off as they can not easily see where the narrow ramps meet the square platform center. No major agility organization in the United States currently allows the use of a crossover. The Kennel Club discontinued the use of this obstacle in January 2009. No other organization used this obstacle. A Boxer exiting a tunnel. Note the sandbags to prevent tunnel movement. A vinyl tube, 10 to 20 feet (3.0 to 6.1 m) long and about 2 feet (61 cm) in diameter, through which the dog runs. The tunnel is constructed of flexible vinyl and wire, such that it can be configured in a straight line, or in a variety of curves. A barrel-like cylinder with a tube of fabric attached around one end. The fabric extends about 8 to 12 feet (2.4 to 3.7 m) and lies closed until the dog runs into the open end of the chute and pushes his way out through the fabric tube. As of August 2016, AKC has suspended the use of the collapsed tunnel in all of their competitions due to the injuries that have resulted from this obstacle. UKC agility allows two additional tunnel types, the crawl tunnel and the hoop tunnel, that are not found in other agility organizations. CPE allowed an interconnected set of tunnels called a tunnel maze from 2004 through 2006, but discontinued the tunnel maze as of the 2007 rulebook. This winged single jump is adjusted in height so that small dogs such as Pembroke Welsh Corgis may compete against similar-sized dogs. Two uprights supporting a horizontal bar over which the dog jumps. The height is adjusted for dogs of different heights. The uprights can be simple stanchions or can have wings of various shapes, sizes, and colors. Two uprights supporting two or three horizontal bars spread forward or back from each other. The double can have parallel or ascending horizontal bars; the triple always has ascending bars. The spread between the horizontal bars is sometimes adjusted based on the height of the dog. Instead of horizontal bars, the jump is a solid panel from the ground up to the jump height, constructed of several short panels that can be removed to adjust the height for different dog heights. 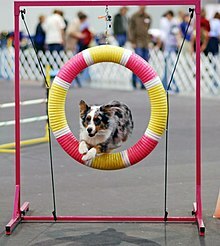 An Australian Shepherd jumping through a tire jump. A set of four or five slightly raised platforms that form a broad area over which the dog must jump without setting their feet on any of the platforms. The length of the jump is adjusted for the dog's height. A torus shape that is roughly the size of a tire (18 inches (46 cm) to 24 inches (61 cm) inside diameter) and suspended in a frame. 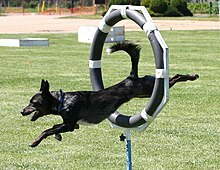 The dog must jump through the opening of the "tire"; like other jumps, the height is adjusted for dogs of different sizes. The tire is usually wrapped with tape both for visibility and to cover any openings or uneven places in which the dog could catch. Many organizations now allow or require a so-called displaceable or breakaway tire, where the tire comes apart in some way if the dog hits it hard enough. 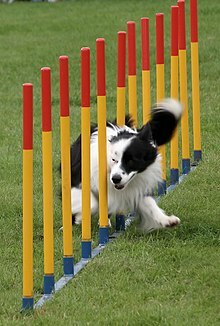 UKC agility allows a variety of hurdles not found in other agility organizations: bush hurdle, high hurdle, log hurdle, picket fence hurdle, rail fence hurdle, long hurdle, window hurdle, and water hurdle. A Border Collie demonstrates fast weave poles. An elevated square platform about 3-foot-by-3-foot (1-meter-by-1-meter) square onto which the dog must jump and pause, either sitting or in a down position, for a designated period of time which is counted out by the judge, usually about 5 seconds. The height ranges from about 8 to 30 inches (20 to 76 cm) depending on the dog's height and sponsoring organization. A variation on the pause table. The pause box is a square marked off on the ground, usually with plastic pipe or construction tape, where the dog must perform the "pause" behavior (in either a sit or a down) just as he would on the elevated table. Similar to a slalom, this is a series of 5 to 12 upright poles, each about 3 feet (0.91 m) tall and spaced about 24 inches (61 cm) apart (spacing for AKC was 21 inches (53 cm) until it was changed in January 2010. The extra three inches was to relieve stress on the dog's back. ), through which the dog weaves. The dog must always enter with the first pole to his left, and must not skip poles. For many dogs, weave poles are one of the most difficult obstacles to master. 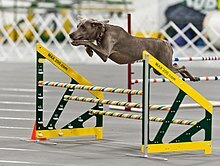 UKC agility allows the following obstacles not found in other agility organizations: swing plank, sway bridge, and platform jump. NADAC also uses a hoop obstacle. A Hoopers course consists entirely of hoops, but hoops may be used in other courses as well. Each organization has its own rules about what constitutes a fault, and whether one can earn a qualifying score with faulted runs. 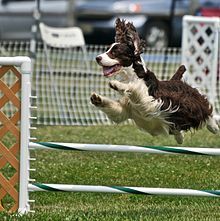 A completed run that passes the minimum defined standards for time, faults, points, etc., is referred to as a qualifying run and in some cases earns credit towards agility titles. A qualifying run is also referred to as a leg or a Q. A clean run or clear round is one with no faults. Going over the maximum time allotted by the judge to complete a course (the standard course time). The dog failing to place a foot in the contact zone while performing a contact obstacle. Leaping from a contact obstacle a long way above the descending contact zone is sometimes called a flyoff. Displacing a bar (or panel) when going over a jump. Entering the weave poles incorrectly (the dog must enter with the first pole on his left), skipping poles, or backweaving when attempting to correct missed poles. Taking the wrong obstacle on a course in which the obstacles are numbered sequentially. The dog making an approach towards the correct obstacle, but then turning away or hesitating significantly before attempting the obstacle. The dog running past the correct obstacle. The handler deliberately—or, in some cases, accidentally—touching the dog or an obstacle. The handler deliberately taking an action that appears to be for the purpose of training the dog, rather than trying to run the course correctly, such as asking the dog to repeat an obstacle that he has already completed when the rules don't allow it. The penalty for this varies by organization: the handler may be excused from the ring, elimination may be scored but the handler is allowed to continue, the handler and dog may be allowed to complete their run but are given the maximum course time, et cetera. Some organizations have no penalty for training in the ring. In general it is up to the judge to determine what is or isn't training in the ring. Given the available set of obstacles and possible faults, there are many permutations of games, or classes, that one can play on the agility field. A typical course is laid out within a 100-by-100-foot (30 by 30 m) area, with roughly 10 to 20 feet (3.0 to 6.1 m) between obstacles. Judges design their own courses (in NADAC, judges can do so or can select from previously designed courses) using the rules of the sanctioning organization. Each organization decides which classes are valid for achieving titles and how each must be performed, but there are many similarities. Standard,regular, or agility: This is a numbered course consisting of (usually) at least one of each of the three primary contact obstacles (not including the crossover) plus jumps, tunnels, and weave poles of various flavors. A novice course might consist of as few as 15 obstacles; a higher-level course might have 22. The dog must negotiate the obstacles in the correct order within the standard course time (SCT). Jumpers or jumping: This numbered course consists primarily of various types of jumps and, depending on the organization, also weave poles and tunnels. The dog must negotiate the obstacles in the correct order within the standard course time (SCT). The dogs achieve their fastest speed on these courses because there are no contact obstacles to slow them down. Gamblers, fifteen and send time (FAST), jackpot, or joker: An unnumbered course. The game typically consists of two parts, an opening period and the closing period, also known as the gamble, joker, or jackpot. In the opening period, the dog has a certain amount of time in which to do whatever obstacles the handler deems appropriate and accrues points based on the obstacles completed. At the end of the allocated time for the opening period, a horn or whistle blows. At that point, the gamble begins. The dog has a certain small amount of time (about 15 seconds) in which to complete a sequence of obstacles designated by the judge ahead of time. (In FAST, there is no opening and closing period and this sequence may be taken at any time during the run.) The challenge is that there is a line on the ground past which the handler must not step, typically paralleling the gamble obstacles and from 5 to 20 feet (1.5 to 6.1 m) away depending on the level of competition. The handler must choose an opening sequence that flows comfortably for the individual dog's skills and experience. The sequence must also be planned so that, when the horn blows, the dog is in a good position to immediately begin the gamble. The greatest challenge is the distance handling—getting the dog to move or even turn away from you. Snooker: This is loosely based on the billiard game of Snooker. The course has at least three red jumps, each numbered 1, and six other obstacles numbered 2 through 7. The dog accumulates points based on the obstacle's number. This also has two parts, an opening sequence and a closing sequence. In the opening sequence, the dog must complete a 1, then any obstacle numbered 2 to 7, a different 1 and any 2 to 7 obstacle (including the one already performed), and yet another different 1 and another 2-7 obstacle. For example, the dog could perform the red on the left for 1 point, the 7-point obstacle, the red in the middle for 1 point and then the 7-pointer again, then the red on the far side of the course and the 7-pointer one more time, for a total of 24 points in the opening. After successfully completing this, the dog must complete the obstacles 2-7, in order, for an additional possible 27 points. Failure to follow these rules exactly (such as knocking a bar or taking 2 reds in a row) results in the dog and handler being whistled off the course. Strategy and entertainment value: The dogs might have to negotiate between other obstacles without taking them or make a difficult entry to the obstacle, often combined with a longer distance between the reds and the 7 so that it consumes more time to do the higher-point obstacle in the opening. Power and speed: The course consists of two sections. The first is an untimed "Power" section, which features the contact equipment and any of the following at the discretion of the judge setting the course: weaves, table, a-frame, spread jump, long jump. If this section is negotiated without accruing any faults, the dog and handler may go on to the "Speed" section, which consists of a timed jumping course. Team, pairs, or relay: Two or three dog-and-handler teams each execute a portion of a Standard agility course, with the handlers exchanging a baton between sections. Time to beat, or time 2 beat (T2B): This class, which is only available at AKC events, is meant to challenge both the handler and the dog to set a clean, efficient line with an emphasis on speed and accuracy. T2B does not employ the dog-walk, chute, pause table, or broad jump, making it the fastest brand of AKC agility yet. A minimum of 17 and a maximum of 19 obstacles must be used, and one set of twelve Weave Poles is required. In this class, refusals are not scored. If a dog fails to complete the weaves or misses the entrance, he gets two more tries to finish the obstacle before receiving an F (I.e. failure). To earn the T2B title, a dog must reach 15 qualifying scores and 100 points. For each jump height, the dog who runs the course in the fastest time will earn 10 points. The other dogs competing at that jump height will earn something less than 10 points, according to a scale of percentages based on the fastest time and how near the dog came to equaling it. Australian Koolie smooth coat competing in an agility trial. A St. Bernard competing in dog agility. Dogs are measured in height at the peak of their withers (shoulders). They are then divided into height groups; for example, dogs measuring between 12 and 16 inches (30 and 41 cm) might compete together with the jumps set at a height of 16 inches (41 cm). This ensures that dogs who might have an advantage on a particular course because of their size (larger or smaller) keep the advantage to a minimum. Dogs are further divided into their experience levels. So, for example, there may be competitions for 12 inches (30 cm) Novice dogs, 12 inches (30 cm) Intermediate dogs, and 12 inches (30 cm) Masters dogs. Dogs typically have to have certain numbers of successes at lower levels before they can move up to compete with more advanced dogs. Some organizations allow beginner dogs to run on-leash in some situations. Some organizations divide dogs into additional optional categories because the dogs are older (usually over seven years), need to jump at a lower height than the regular standard, or the like. For example, a veteran's class for older dogs might allow the dogs to jump at a height lower than the standard height and to have more time to complete the course. Otherwise, dogs are not separated by age; they must only be of at least a specified minimum age to compete. Some organizations divide handlers into additional optional categories, such as junior handlers (usually under 18), handicapped handlers, or senior handlers. Dogs are not separated by breed in agility competitions. Some organizations require that dogs entering its competitions must be purebred, but many organizations allow any sound, able-bodied dog, whether purebred or mixed-breed. Blind dogs and dogs with disabilities judged to make the course run physically dangerous to the dog are generally ineligible for the dog's own safety. The history of dog agility can be traced to a demonstration at the Crufts dog show in the late 1970s in the United Kingdom. Dogs were run around a course designed similar to horse jumping courses during intermission as a way to entertain the audience. It has since spread rapidly around the world, with major competitions held worldwide. Dog agility is an international dog sport with many different sanctioning organizations and competitions worldwide. 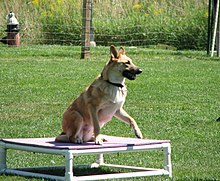 A mixed-breed dog demonstrates the teeter at an agility class. Dogs can begin training for agility at any age; however, care is taken when training dogs under a year old so as to not harm their developing joints. Dogs generally start training on simplified, smaller, or lowered (in height) agility equipment and training aids (such as ladders and wobbling boards to train careful footing); however, even quickly learning puppies must be finished growing before training on equipment at standard height to prevent injury. Introducing a new dog to the agility obstacles varies in response. Each individual dog learns at his own pace; confident dogs may charge over equipment with little encouragement, while more timid dogs may take weeks to overcome their hesitations with much encouragement. Both scenarios present their own challenges; dogs may be overconfident and sloppy to the point where they have a serious accident, so self-control must be taught. Timid dogs need extra support to boost their confidence. Given the right encouragement, a timid dog can gain confidence through learning the sport itself. The size of the dog can also have an effect on training obstacles, particularly with the chute, in which smaller dogs are prone to getting trapped and tangled inside. Great effort is taken in general to see that the dog is always safe and has a good experience in training for agility so that they do not fear the obstacles, and instead perform them willingly and with enthusiasm. The teeter-totter (or see-saw) and the weave poles are typically the most challenging obstacles to teach to any dog. Many dogs are wary of the see-saw's movement, and the weave poles involve a behavior that does not occur naturally to the dog. Contact obstacles in general are challenging to train in a manner that ensures that the dog touches the contact zone without sacrificing speed. Whether for competition or recreation, the most important skill for an agility team to learn is how to work together quickly, efficiently, and safely. Dogs vary greatly in their speed and accuracy of completing a course, as well as in their preferences for obstacles; therefore, the handler must adjust their handling style to suit and support the dog. Training techniques for each piece of equipment varies. For example, the techniques for training the weave poles include using offset poles that gradually move more in line with each other; using poles that tilt outward from the base and gradually become upright; using wires or gates around the poles forcing the dog into the desired path; putting a hand in the dog's collar and guiding the dog through while leading with an incentive; teaching the dog to run full speed between two poles and gradually increasing the angle of approach and number of poles; et cetera. Access to agility equipment, especially the larger contact obstacles, which can be expensive, difficult to build, and require a lot of space to use. Seeking the guidance and expertise of more experienced handlers. Enjoying the social venue that many classes provide. Training in a more distracting environment, which is helpful in preparation for competition. In addition to the technical and educational training, physical training must also be done. At the very least, the dog must be fit enough to run and jump without causing stress or injury to its body. The handler can also benefit from being physically fit, but with some handling styles it is not necessary to keep up with the dog (nor is it possible with very fast dogs). Being able to handle a dog from a distance allows mobility-impaired handlers to participate in the sport en par with mobile handlers. Research has also demonstrated health benefits to handlers engaged in dog agility. Competitions (also called trials or matches or shows) are usually hosted by a specific local club. The club might be devoted solely to dog agility, or it might be primarily a breed club that wants to promote the working abilities of its breed, or it might be a club that hosts many types of dog sports. The club contracts with judges who are licensed by the sanctioning organization and applies to the organization for permission to hold a trial on a specific date or weekend; most trials are two-day weekend events. The club designates a member to be the chairperson or show manager, who is responsible for ensuring that the trial takes place, and another member to be the secretary, who is responsible for providing competitors with the show premium or schedule—a document that describes the specific competition, summarizes the rules, describes the trial site, and includes an entry form—receiving completed entry forms, sending out running orders, producing running-order lists for the day of competition, and compiling the results from the trial to send to the sanctioning organization. The designated chief ring steward or ring manager is responsible for finding and assigning workers, almost always volunteers, to perform the myriad tasks involved in putting on a trial. For example, if electronic timing is not being used, each class needs a timer, who ensures that the dog's running time is recorded, a scribe, who records the judge's calls as a dog runs the class, and pole setters (or ring stewards), who ensure that jump bars are reset when they are knocked off and change jump heights for dogs of different sizes. 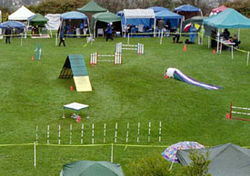 Agility competitions require considerable space. Each ring is usually at least 5,000 square feet (I.e 465 square meters); however, exact dimensions vary according to the organizations. Competitions can have anywhere from one to a dozen rings. The ground must be non-slip and level, usually being either packed dirt, grass, carpeting, or padded matting. In addition, competitors need space to set up quarters for their dogs and gear; when space permits, competitors often bring pop up canopies or screenroom awning tents for shade. Dogs, when not competing, are usually left to rest in exercise pens, crates, or dog tents familiar and enclosed environments in which they can relax and recover between runs. Handlers also bring reflective cloths to protect their dogs from sun exposure and to calm them down (by covering their crates with the cloths). There also needs to be space for many handlers with dogs on leashes to move freely around the rings without crowding, and space for warming up, exercising, and pottying dogs. Adjacent to the site, parking must be available for all competitors. At weekend or weeklong shows that offer camping, space needs to be provided both for competitors' caravans and tents, and for the small fenced enclosures or gardens that they set up around them. In heavily populated areas, therefore, it is uncommon to find real estate inexpensive enough to devote entirely to agility, so sites are usually rented for the weekend. Even in more rural areas, agility-only sites are uncommon. Popular locations include large parks, covered horse-riding arenas, and in cold-winter areas, large, empty warehouses in which mats or carpet can be laid. Before the trial, each judge designs the courses that he or she will judge at the competition. The sanctioning organization usually reviews and approves the courses to ensure that they meet the organization's guidelines. Guidelines include such issues as how far apart obstacles must be, how many turns are allowed (or required) on a course, which obstacles and how many of each must appear on the course, and so on. The rules vary by level of competition and by organization. 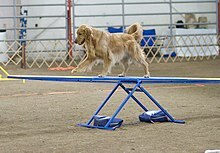 Golden Retriever in an agility competition. Before each class, or the evening before the first class, course builders use course maps provided by the judges to place equipment on the course. The chief course builder is usually an experienced competitor who understands what equipment is legal, how it must be configured, how each must be aligned compared to other obstacles, and can direct several course-building volunteers to efficiently move the equipment into place. To make the job easier, courses are often marked in some way to correspond to a grid: for example, if course maps are printed on a grid of 10-foot-by-10-foot squares, the posts that hold the ring ropes marking the course's four sides are often set 10 feet apart. The judge often holds a briefing for competitors before each class, to review the rules and explain specific requirements for a particular course. For Standard courses for experienced competitors, the judge's briefing is often minimal or dispensed with altogether. For novice handlers in classes with complex rules, the briefings can be much longer. The competitors then walk the course (as described earlier). When the walk-through ends, the gate steward or caller ensures that dogs enter the ring in the running order previously determined by the trial secretary and manages changes to the running order for handlers who might have conflicts with other rings of competition. As each dog and handler team runs the course, the dog is timed either by a person with a stopwatch or with an electronic timer, and the scribe writes the judge's calls and the dog's final time on a scribe sheet or ticket, which is then taken to the score table for recording. At the score table, scorekeepers compile the results in a variety of ways. Some organizations require or encourage computerized scorekeeping; others[who?] require certain types of manual score sheets to be filled out. When all the dogs in a given height group, level, and class have run, the score table compares run times, faults, and any other requirements to determine placements (and, for classes that provide qualifying points towards titles, which dogs earned qualifying scores). Each ring might run several classes during a day of competition, requiring multiple course builds, walk throughs, briefings, and so on. 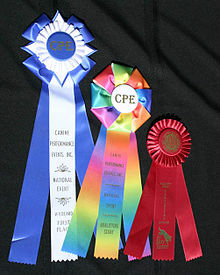 A variety of rosette award ribbons from dog agility competitions. Awards are usually given for placements and for qualifying scores. Such awards are often flat ribbons, rosettes, commemorative plaques, trophies, medals, or pins. Some clubs award high-in-trial awards, calculated in various ways, or other special awards for the trial. Dogs who complete their final qualifying scores to become agility champions are often presented with special awards. Many Kennel Clubs also award titles to those who manage to qualify enough times in a particular level. Most clubs require three qualifying scores in any level to get the corresponding title, however, other clubs may require more or less. Surveys of handlers indicates that about 1 in 3 dogs incur injuries from agility related activities. The most common types of injuries were (in order) strains, sprains and contusions. Locations most commonly injured were shoulders, back, phalanges (forelimb/hindlimb) and neck. Injuries were most commonly perceived as being caused by interactions with bar jumps (contact), A-frames and dog walk obstacles (contact and/or fall). There were no relationship between the use of warm-up and cool-down exercises and injuries. ^ "AAC Rules and Regulations v4.0" (PDF). Retrieved April 6, 2011. ^ "AKC Regulations for Agility Trials" (PDF). AKC.org. American Kennel Club. Retrieved December 8, 2009. ^ "NADAC Exhibitor's Handbook". NADAC.com. North American Dog Agility Council. Retrieved December 8, 2009. ^ "Official UKC Rules and Regulations" (PDF). UKC.org. United Kennel Club. Retrieved April 6, 2011. ^ "USDAA Rules and Regulations" (PDF). USDAA.com. United States Dog Agility Association. Retrieved December 8, 2009. ^ "CKC Agility Rules and Regulations" (PDF). CKC.org. Canadian Kennel Club. Retrieved May 9, 2014. ^ "AKC Agility Suspends Use of the Collapsed Tunnel". AKC.org. American Kennel Club. Retrieved November 12, 2016. ^ "2011 Rulebook" (PDF). Canine Performance Events. 2011. Archived from the original (PDF) on July 19, 2011. Retrieved April 6, 2011. ^ "USDAA news release about tire specifications". Retrieved December 7, 2011. ^ "Time 2 Beat" (PDF). AKC.org. American Kennel Club. May 10, 2012. Retrieved November 22, 2016. ^ "AKC Rules" (PDF). AKC.org. American Kennel Club. "Classes, Titles, and Height Divisions". Retrieved December 7, 2011. ^ "ASCA Rules" (PDF). ASCA. Australian Shepherd Club of America. "Measuring a Dog's Height" and "ASCA Sanctioned Classes, Divisions & Levels". Retrieved December 7, 2011. ^ "CPE Rules" (PDF). K9CPE.com. Canine Performance Events. "Rules", 4, 5, 10. Retrieved December 7, 2011. ^ "FCI Rules" (DOC). FCI.be. Fédération Cynologique Internationale. "Tests, Categories, and Classes". Retrieved December 7, 2011. ^ "NADAC Rules and FAQs". NADAC.com. North American Dog Agility Council. Retrieved December 7, 2011. ^ "USDAA Certification Programs". USDAA.com. United States Dog Agility Association. Retrieved December 7, 2011. ^ "The Kennel Club General Information, Grading Structure, and Measurements". thekennelclub.org.uk. The Kennel Club. Retrieved December 7, 2011. ^ a b c d e f Bonham, Margaret H. (2000). Introduction to Dog Agility. Barron's Educational Series. ISBN 0-7641-1439-5. ^ a b c d e f Daniels, Julie (1991). Enjoying Dog Agility: From Backyard to Competition. Doral Publishing. ISBN 0-944875-16-5. ^ a b c d e f g h i O'Neil, Jacqueline (1998). All About Agility. Howell Books. ISBN 0-87605-412-2. ^ "Regulations for Agility Trials" (PDF). AKC.org. American Kennel Club. February 1, 2016. Retrieved November 22, 2016. ^ Cullen, K. L.; Dickey, J. P.; Bent, L. R.; Thomason, J. J.; Moëns, N. M. M. (2013). "Survey-based analysis of risk factors for injury among dogs participating in agility training and competition events". Journal of the American Veterinary Medical Association. 243 (7): 1019–1024. doi:10.2460/javma.243.7.1019. PMID 24050569. ^ Cullen, K. L.; Dickey, J. P.; Bent, L. R.; Thomason, J. J.; Moëns, N. M. M. (2013). "Internet-based survey of the nature and perceived causes of injury to dogs participating in agility training and competition events". Journal of the American Veterinary Medical Association. 243 (7): 1010–1018. doi:10.2460/javma.243.7.1010. PMID 24050568. Wikimedia Commons has media related to Agility.